Are you planning a tropical island wedding on the beach? 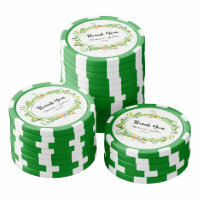 Have you considered casino chips as wedding favors for your guests? 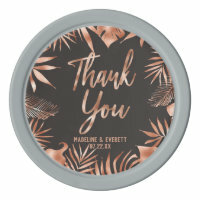 Casino chips can be used for a varriety of functions for your tropical beach wedding. There are chips available as save the date tokens. Poker chips also make great wedding favors for your guests. They are small, and easily placed in a gift bag. Poker chips can also be used to allow your guests to get drinks at the bar. All you need do is agree terms with your caterer as to how much alcohol you will pay for, this can be then be calculated in terms of glasses allowed for the function. Then give each guest one chip per glass to spend at the bar. Thus fixing your bar cost for the night. Helping you to budget the reception. There you are a few ideas for Poker chips at your beach wedding. I hope that you found these ideas useful.